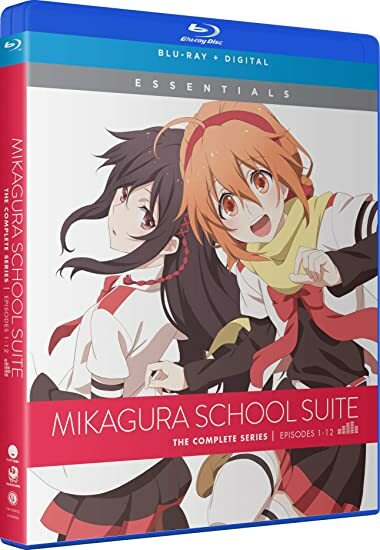 Mikagura School Suite: The Complete Series - BUY THIS DVD! From studio Doga Kobo, who brought you Laughing Under the Clouds and Yuruyuri, comes a new magic school adventure! Eruna Ichinomiya has no desire to focus on what high school to pick. She'd rather spend her time chasing after pretty girls or playing dating sims. After all, when the only job you want is to watch TV all day, who cares what school you attend? But when her cousin Shigure Ninomiya shows her the pamphlet to Mikagura Academy, Eruna finds her picture-perfect reason to go to high school: the beautiful Seisa Mikagura. After a bizarre entrance exam and interview with a flying, talking cat, it's clear that Mikagura is not a typical high school. Students are focused more on clubs, battles, and their special magical attacks instead of regular studies. And if Eruna wants to win over the cool, powerful Seisa, she's got to join a club and hone her own special attack. But that's easier said than done. Especially when there are so many cute girls to distract her! THEN SEND IN A COMMENT ABOUT YOUR FAVORITE FUNIMATION TITLE (you may click on artwork above for a refresher) PLUS YOUR NAME AND ADDRESS TO contests@efilmcritic.com or WeLoveHBS@aol.com. (Just one e-mail please.) Put [b]"CAN I GET THE MIKAGURA SCHOOL SUITE" in the subject line and cross your fingers. We will draw names and one of the prizes could be yours. Only 1 entry per household.